UNINTECH Receives ACEC Texas Award - Unintech Consulting Engineers, Inc.
UNINTECH is proud to announce that it has been named a Gold Medal winner for the American Council of Engineering Companies of Texas (ACEC Texas) Engineering Excellence Awards. UNINTECH won in the Structural Systems category for its structural engineering work on the San Antonio Independent School District Alamo Stadium renovation project. 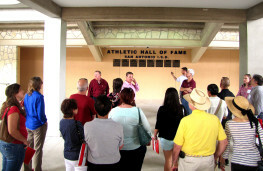 Alamo Stadium was built in 1940 and is listed on the National Register of Historic Places. This award qualifies UNINTECH’s project for advancement to the national ACEC Engineering Excellence Awards held in April 2015. The ACEC Engineering Excellence Awards Competition has been held by the ACEC since 1975 to honor and recognize outstanding achievements within the engineering community. A panel of judges made selections based on uniqueness, originality, technical value to the engineering profession, complexity and how successfully the project met the needs of the client, according to the ACEC. For more information on the award or full list of winners please visit www.acectx.org.